Hyderabad: A huge 5,570-kg 'laddu' prepared for the recent Ganesh festival in Andhra Pradesh has entered the Guinness World Records. The laddu was prepared by Suvarnabhoomi Developers Private Limited. It was prepared for the 117 ft-tall idol of Ganesha installed in Visakhapatnam in September and was used as 'prasadam' (offering) for devotees during the 21-day long festival. As many as 50 workers laboured for a week to make the laddu, the ingredients of which included sugar, flour, moong dal and dry fruits. 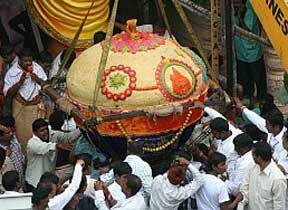 The record of the largest laddu (551 kg) was earlier held by a Hindu temple in Britain.